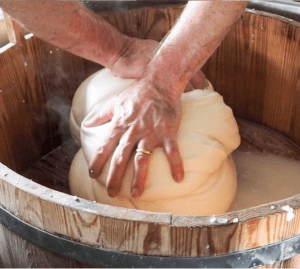 Travelling up from West Cork for the day, Marco, head cheese maker at Toonsbridge Dairy will lead a hands on workshop showing you the techniques to make mozzarella, ricotta, straciatella and buratta. These will be in the Puglia tradition. All participants will stretch and hand shape the boiling curd and go home with some of their own freshly made cheese. Marco is the Toons Bridge Dairy head cheese maker, or “casaro”. From Battipaglia, near Salerno in Campania, which is the town most synonymous with buffalo mozzarella production. Marco’s family have a long tradition of mozzarella making, including his grandfather being the first “casaro” to use whey starter in the area in the 1930’s. Marco has won several awards for his mozzarella making, including European Multi Champion 2013 and 2015. 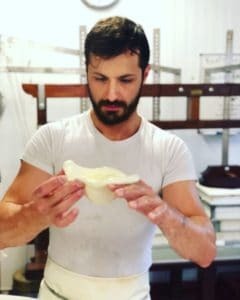 He is expert in both the Campania whey starter technique and also the Puglia direct acidification, His cheese repertoire includes mozzarella, scamorza, caciocavallo, ricotta, stracciatella, burrata and stracchino. Marco is equally at home using buffalo or cows milk, and has even used our sheeps milk to make mozzarella. If you are a student or currently unemployed / recently retired we are offering a €20 discount for this workshop. Simply add the discount code EATITH20 at the checkout. ID will be checked on the day.